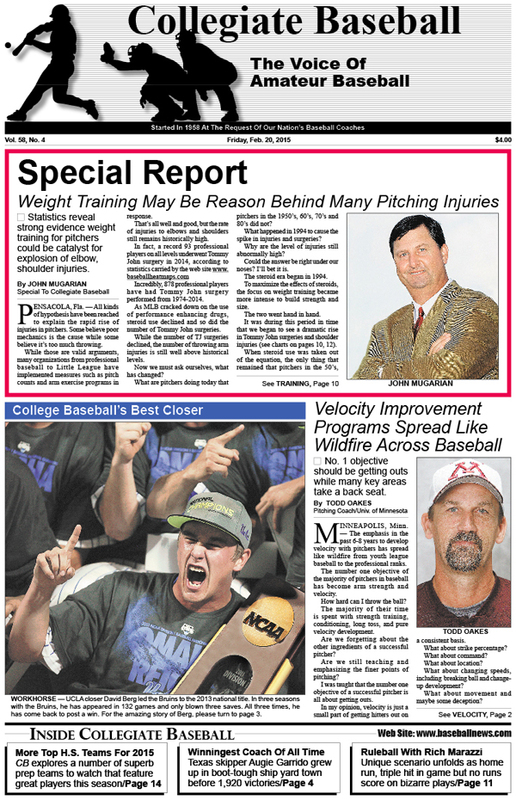 • Special Report: Weight training may be reason behind many pitching injuries that result in Tommy John surgery. • Feature On A Legend: Texas skipper Augie Garrido grew up in a boot-tough ship yard town before embarking on a remarkable coaching career in baseball . • Todd Oakes: Velocity improvement programs spread like wildfire across baseball while many key areas take a back seat. • Charlie Greene: Teachable moments can take place at any time in baseball? • USA’s Top Closer UCLA’s David Berg has appeared in 132 games and only blown 3 saves during an amazing college career. • Editorial: Pitching command is terrible in baseball as professional pitchers only hit their target 24 percent of time in 2014. • College Notes: Top achievements across nation featured, including walk-off grand slam, milestones for coaches. • Ruleball With Rich Marazzi: Appeal plays are filled with unexpected consequences if you are not well prepared for anything that might happen during a game. • Q&A With Louisville Coach Dan McDonnell: Al Figone asks him questions about sliding techniques. • More Elite High School Teams For 2015: Collegiate Baseball examines additional powerhouse teams across USA. • Brian Cain Column: Here’s how you build great team chemistry with baseball teams (First of a 3-part series). To purchase the Feb. 20, 2015 edition of Collegiate Baseball, CLICK HERE.